"All right, marines, we have a mission. They ain't payin' us by the hour. Let's move out." 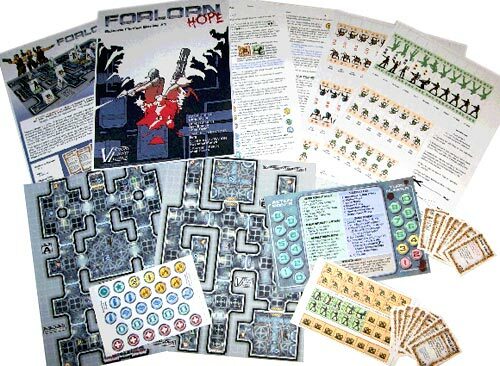 Forlorn: Hope is a game of tactical combat between a squad of human Space Marines and a nearly unlimited horde of vicious alien Xenos aboard the claustrophobic space station, Hope. The Marine player utilizes a limited number of Action Points to command the Forlorn Squad, hoping that luck and a timely rush of adrenaline will help them to complete their desperate mission with at least a few survivors. The Xeno player has no such worries, as the single-minded horde relentlessly presses in from all sides, fearlessly confronting the human's advantage in firepower, proving that quantity has a quality all its own. This low-complexity, quick-playing game includes two shipboard maps and rules for two-player and solitaire play. Tight, tense, and gripping gameplay will have players making whatever sacrifice is called for in this ultimate battle for survival aboard a contested space station. Can you lead Forlorn Squad on the missions necessary for humanity to survive? Or will the Xenos prove too numerous to stop their relentless destruction? Play Forlorn: Hope and find out. 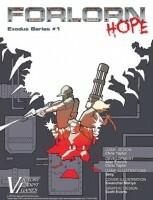 Add a Review for "Forlorn: Hope"